A science fiction comedy from the director of Timecrimes, Colossal is unexpectedly funny, disturbing and thought-provoking film. Keeping the premise as short and to the point as possible, it tells the story of Gloria (Anne Hathaway) who discovers she has a psychic link to a kaiju in South Korea. You don’t really need more than that, do you? If you’re after a film that’s unlike anything you’ve seen before, then this is it. But this recommendation comes with caveats. 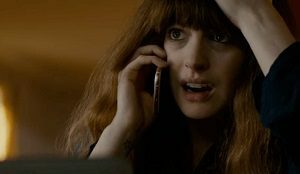 The thing about Colossal is that it veers wildly from what you may be expecting. This Garden State meets Being John Malkovich meets Pacific Rim movie gets rather dark. So dark, in fact, that I began to worry that the filmmakers didn’t know what they were dealing with. When Bad Things started happening, I was concerned that the film didn’t perceive them as particularly bad. I’m dancing around the issue because I hate spoilers, but suffice to say the film gets very dark indeed before coming out on the right side of the story. I think. On the one hand, a film that challenges expectations is a wonderful thing. But I couldn’t shake the feeling that those hoping for a quirky night out at the cinema might become a little shocked at the relationships that are presented here. The writing is good, but it’s entirely possible someone might walk out of the film before it’s finished, missing the dénouement. Hathway and Jason Sudeikis are great in the lead roles, the latter providing a particularly complex performance. Dan Stevens isn’t exactly stretching his acting muscles here, whilst Austin Stowell and Tim Blake Nelson are great as one-note supporting characters. The visual effects are good enough, considering this is an offbeat comedy, whilst the cinematography is nothing spectacular. Strangely enough, Bear McCreary’s score was a complete misfire for me – surprising considering his previously fantastic work. Nacho Vigalondo’s direction is the real star here, and his performers give it their all. Colossal is a wonderfully unexpected night out at the cinema. But I wonder if it needs a trigger warning. Colossal is released in Australia on 13 April 2017. This entry was posted in Film Reviews and tagged Comedy, Drama, Science Fiction by Stuart Wilson. Bookmark the permalink.